This weekend, I had the honor of presenting at the International Reading Association’s annual conference with Amanda Hartman. Our workshop title: Thinking, Talking, and Writing about Nonfiction Reading in Read Aloud, Small Groups, and Book Clubs. In many ways, Book Clubs are the pinnacle and the culmination of what we teach in reading and writing workshops. The success of a book club is determined in large part not by what students do while with their group, but the ways in which they prepare beforehand. Students must grow not just understanding but also ideas as they read. They must record these ideas in writing, and they must plan to communicate these ideas in ways that their whole group will understand. To help organize your teaching and to help kids to organize their understanding of what makes a successful book club, consider teaching preparation moves and talk moves as two separate categories. A chart containing both categories will help students to understand that the preparation is just as (or more!) important than what they do during the club. 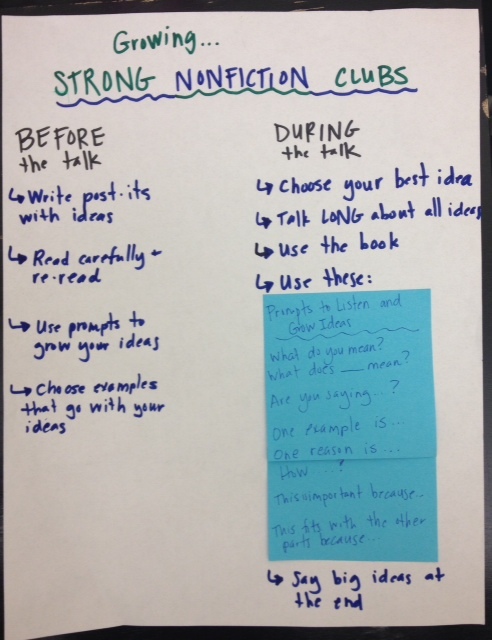 Following are possible teaching points to help kids get better at writing to prepare for book clubs. Read closely, and reread. Writing well about books begins with reading books well. Enough said. 2. Goblin sharks are one of nature’s most prehistoric animals. They have been around since the eocene epoch. At first glance, the second might seem more sophisticated and a better contribution to a book club. However, If actually presented in a book club, it is the first post-it that likely would yield more of a discussion. A post-it intended to support comprehension could contain a fact. A post-it intended to yield discussion should contain an idea. Write many post-its, and choose the best one to share with the club. Students need lots of practice and lots of opportunity for self-reflection. Teaching them to write a lot and to stop often to rank their own writing to choose the one that is “best” for their club discussion gives them this practice. Include examples to go with ideas. This is where facts have a place in book club work. Sharks are cool is a viable book club post-it. An even stronger post-it might say : Sharks are cool. One reason they are cool is that they are like the garbage collectors of the ocean. They eat dead fish that might make other animals sick. A way to ramp up this teaching is to encourage kids to quote authors and name sources from which their facts came. Yes, even young children can do this! Use thought prompts to say more. Thought prompts aren’t just for discussions. They are for writing too. To show kids how thought prompts can lead to the kind of deeper thinking valued in book clubs, consider using a tired-and-true guided practice technique from staff developers at the Reading and Writing Project. Have kids choose the idea they want to share with their clubs. Ask them to write it on a new (longer) post-it or piece of paper. Call out a few prompts one at a time , and ask them to jot the prompt and then to keep writing based on the prompt. Original idea: Sharks are cool! Written response: For example, many have multiple rows of teeth, so that when one tooth falls out, they have another right there to take its place. Written response: This is important because they need their teeth to be very sharp so they can eat their prey. This also explains why people find so many shark teeth on the beach. Consider the above post-it. It is structured like a mini-essay. 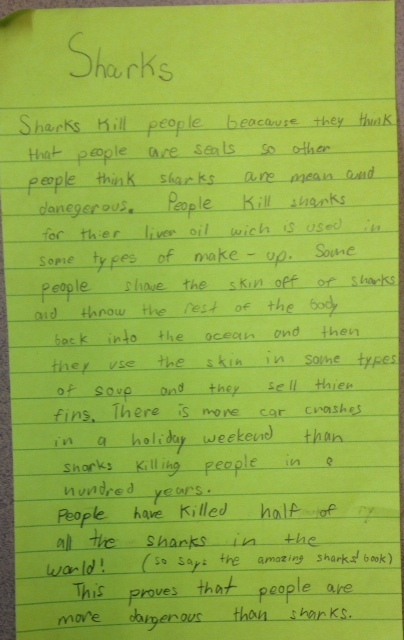 The student starts with an idea, which is actually her counter-point: Sharks people because they think that people are seals so other people think sharks are mean and dangerous. Then, she lists examples from her reading to support her actual point: People kill sharks for their liver oil which is used in some types of make-up. Some people shave the skin off sharks and throw the rest of the body back into the ocean and then they use the skin in some types of soup and they sell their fins. There is more car crashes in a holiday weekend than sharks killing people in a hundred years. People have killed half of all the sharks in the world! Finally, she names her point: This proves that people are more dangerous than sharks. Not a bad piece of writing about reading! As a final note, when students present their ideas to the group, they must do so with a spirit of generosity and contribution. You can teach students to each choose their best post-it and to place it in the middle of the table as a way to signify that this is the idea that they would like to discuss with the group. Placing this post-it in the middle of the table is a physical letting go of sorts. It signifies: this idea is no longer mine. It belongs to the all of us, and we can discuss it and turn it over in our minds and reshape it until it is a new idea. We’d love to hear from you! Please share other ways you teach students to write to get ready for book clubs. We’d love to hear about what worked, and even what didn’t. Happy book talking and writing! Please forgive the disjointed note. I am following up on a previous post. Pat Neilson – if you read this – you won the Meaning of Maggie giveaway, and want to make sure I get your details so you can claim your prizes. Would you write to me at annagcockerilleliteracy@gmail.com with your address? If I haven’t heard by Monday the 19th I’ll have to pick another winner. ← Time for the Tuesday Slice of Life Story Challenge! Thanks for sharing this, Anna. Love the specific examples you include to support your suggestions! I really enjoyed the ideas shared here particularly the writing ideas. I was wondering if there are videos of lessons I can view and share with others on my team? Great question Cathlyn! Check out the TCRWP videos on Vimeo. http://vimeo.com/tcrwp/albums. Amanda’s whole class accountable talk discussion of Bugs! Bugs! Bugs! (filed under grade K-2 reading videos)is a great example of how to set kids up for this kind of work. Looking for ways to add rigor to nonfiction writing in primary grades, this post hits the spot! Thanks Anna! Do you have any recommendations for more ideas/thinking on book clubs? Your work sounds like seeds for a book. Thanks so much Lisa! You can check out Steph Harvey and Harvey Daniels’s work on Inquiry Circles. Ellin Keene’s book Talk about Understanding may be helpful too. And there is great information on setting up fiction book clubs for older kids in Lucy Calkins’s Units of Study for Reading grades 3-5. Seeds for a book, I like that! That’s great! Let us know how it goes. Excellent strategy for book clubs and classrooms alike. I’m passing this on!